Despite common perception, I think that there aren’t many places to have a coffee and relax late at night. We were driving around the Katong / Marine Parade area and we just couldn’t think of anywhere unique to go. I know there are numerous Hong Kong Cafes around, but we’d just been to one last week, and going to a different chain would just be the same. Besides, we wanted cake, coffee and chocolate, lots of it. In the end, we decided to drive to Old Town Coffee at East Coast Park Big Splash. At least the prices are fairly reasonable compared to cafes, and if the food and drink does not satisfy, well we can console ourselves that we haven’t spent too much. Wish Yakun or Toastbox would consider opening 24hours because I rather prefer those than Old Town. As we parked, we spotted Starbucks. I’ve never been a fan of Starbucks because their coffee is really lousy, but recently, a lot of their outlets have been spruced up and the decor is really inviting. So we ditched Old Town and hopped over to Starbucks to give it another chance. We got a nice quiet seat outside and ordered 2 cups of hot chocolate plus 1 chocolate chip muffin. I wonder who or what gave me the idea that Starbucks is cheap. 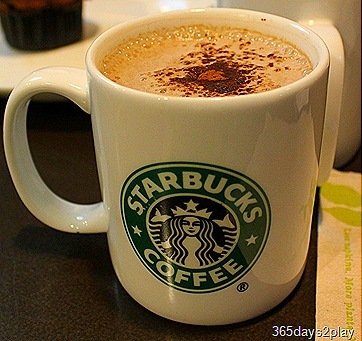 It is EXPENSIVE for a cheap coffee chain! $3.20 Chocolate chip muffin. Despite the abundantly studded chocolate chips, the muffin did not taste chocolatey at all. On the contrary, the muffin was gluggy and tasted somewhat of banana. Not the fragrant banana cake type mind you. 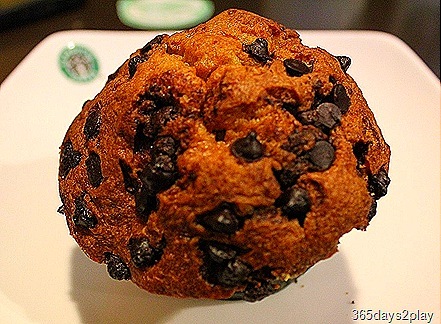 Wonder if the Starbucks people had too much banana muffin batter and didn’t know what to do with it. What a waste of money and calories. The Chocolate Chip Muffin at The Coffee bean is much better, moist, light and literally oozing with chocolate. $6 Hot Chocolate – Can’t get much more expensive than this for just a plain cup of hot chocolate. It was thick and tasty, so at least it satisfied my chocolate craving when the muffin didn’t. However, the hot chocolate had a powdery texture which I didn’t like. I used to think that things at Starbucks are cheaper than the other coffee chains. I was wrong. Once again, The Coffee Bean has a much larger and better tasting hot chocolate served in a better looking glass for the similar price. But really, I think if you want a quick and cheap chocolate drink, just go to Toastbox and order the $1.70 milo. Thick, Chocolatey and satisfying, although I must forewarn you. The “condensed milk” they use at Toastbox isn’t milk. It is a non-dairy sweetener made from palm oil. Betcha didn’t know that, did you? And I wouldn’t be surprised if many other places did that to save costs.